Some interesting reader reactions to my August 15th column on VDARE.com, in which I looked forward to my life as a zek in a thoroughly totalitarianized U.S.A.
A common theme was: "It can't happen here! We have our Second Amendment! The citizens are armed!" Yeah, well, good luck with that. The Whites in the Russian Civil War were armed. They even had well-trained military officers left over from the Tsar's army. Post-WW1 Russia was awash in guns: not just war surplus, but hunters' weapons. Russia is a huge wild country with lots of fauna. Hunting is a natural occupation. 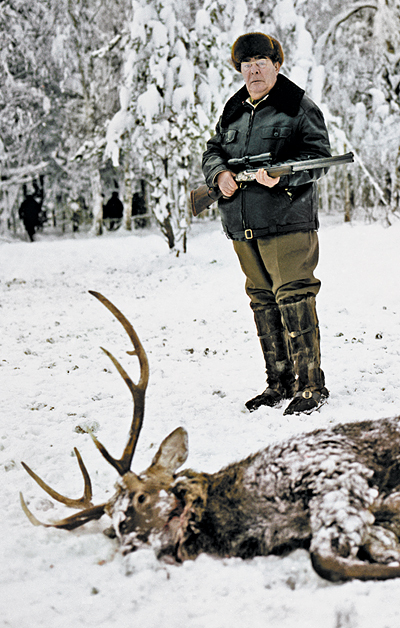 When Soviet leaders wanted to pose as champions of the common man, they went hunting. Newsflash: the Whites lost the Civil War. A variant on this theme was It Can't Happen Here, because we're . . . special. Exceptional. Americans won't put up with that kind of forced uniformity of thought. Won't they? They're putting up with it right now. The poisonous and preposterous "diversity" ideology is mighty in the land, and it's a brave soul—probably one with an independent source of income—that dares defy it. What's that you say? Our law enforcement and military people will save us at last? They at least are immune to the ideological viruses? Dream on. It is the law enforcement officers who are the first to tell us that "the disorders/beating/killing had no racial motive." The military? Ha ha ha ha ha! I was born in the Soviet Union and while I do agree with your point that Marxism (cultural and otherwise) is destroying this country, I do wonder if Americans would be willing to tolerate the Soviet style totalitarian barbarism. The VDARE.com authors often talk about the connection between race and IQ. The majority of Americans trace their ethnic roots to Western Europe, while the Russians, technically Europeans, have always lived under very strong intellectual as well as genetic influence/pressure from Asia. Keeping that in mind I would like make this observation, the people in the Russian heartland were always known as lazy and heavy drinkers (even under the Czars), on the other hand most American farmers are hard working individualists. Even the city dwellers in America tend to admire the ideal of rugged individualism . . . While the establishment (Republican/Democrat Party elites, Hollywood, Big Business etc.) is trying to turn us into some kind of European Socialist utopia, there is a greater chance that this country will collapse along the lines of the Roman Empire (lots of smaller nations with different political systems) rather then the Russian Empire (turning into totalitarian monolith). I don't know about laziness, but heavy drinking among the Rus was noted long before the Tsars showed up ? by 10th-century Arab travelers, for instance. The notion that despotic government is due to Asian influence is an old Russian fancy, shared by (of all people) Lenin. That any race or nation is immune to the totalitarian virus, I seriously doubt. Romans? In its later years, the Roman empire was essentially totalitarian—it was, for example, illegal for a citizen to change his profession. Witch hunting began at this time. [In Spain] in A.D. 385, the Bishop of Avilla, Priscillian, a notable ascetic and preacher, had been accused of gnosticism, Manicheism and moral depravity, had been indicted under the imperial law of witchcraft, tried at Bordeaux, and brought to the imperial court at Trier. There, under torture, he and his companions confessed that they had studied obscene doctrines, held meetings with depraved women at night, and prayed naked. Despite the protests of a leading Gaulish bishop, Martin of Tours, they were executed ? the first instance we have both of the slaughter of 'heretics' and of witch-hunting under Christian auspices. (A History of Christianity, y, by Paul Johnson, p.117). Totalitarianism has deep appeal to fundamental elements of human nature. It has manifested itself in every race and clime, from Siberia to Cambodia, from Korea to Cuba, from Germany to Ethiopia. Why should America be immune? I don't believe it.